Right now, a caravan sits somewhere by a stream, in a park, or in the shadow of a mountain range. Wherever it is, those inside probably feel safe – secure in the knowledge that they’re having the time of the lives, exploring the world. This is what caravanning is about, but the trick is to make sure thieves don’t interrupt these precious moments by stealing your caravan or anything from inside it. At face value, the idea that your big, heavy caravan could be stolen seems ridiculous. But, the truth is, stealing an unsecured van takes just a few minutes and represents an absolute payday for a professional thief. And for those that think that securing your caravan is easier at home than when you’re touring, think again. Securing your van is just as easy when you’re touring as it is at home, and it should be just as high, if not higher, a priority. “Regardless of where you camp, you can take additional measures to avoid becoming the target of an opportunistic thief,” Mr Lamont said. He said there was a good range of security products on the market specifically designed for caravanners and campers, and caravanners should use a selection of these to secure their pride and joy. When the winter winds get too chilly or the summer sizzle gets too hot and you want to stow the caravan somewhere, make sure it’s safe. It seems obvious but a caravan left in the driveway with no security at all is just asking to be stolen. The answer is simple: pop it into a secure shed or behind a fence of gate and lock the door. The trouble is, this only works if you have a secure shed or fenced area at hand. 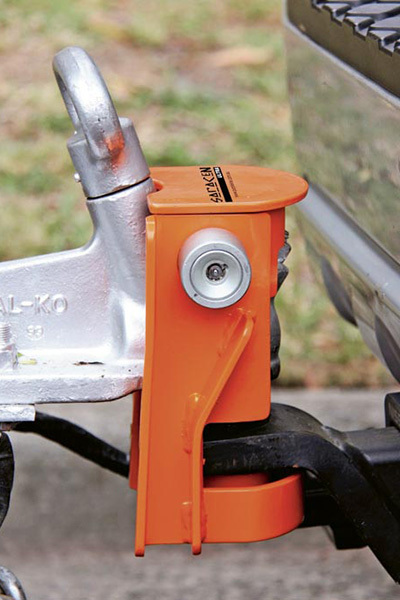 Like a hand in a glove, a hitch fits into a hitch or coupling lock and, hey presto, your van’s a lot more secure. That’s because it stops the hitch from being coupled to a tow vehicle or it prevents releasing the coupling from the towball. If you can’t tow the rig, you can’t steal the rig. Typical of this style of security is the Purple Line Saracen and Saracen Ultra locks. There are universal coupling locks that are suitable for a variety of different couplings. Unfortunately, universal coupling locks are designed only for uncoupled caravans. They can’t be used to prevent thieves from unhitching caravans from their tow vehicles and scampering off with them. Some coupling systems like Vehicle Components’ DO35 are lockable, making them versatile offroad hitches that are also secure. For those on a bit of a budget, it’s cheap insurance to slip down to the local hardware and pick up a padlock and chain to whack on a drawbar or chain the tandem wheels together. Although it’s easy enough to get past, it’s a cost-effective deterrent. It works on the basis that if you make things a little too hard for a time-poor thief, you’re less likely to lose your precious home on wheels. A wheel clamp is an ideal deterrent. It’s next to impossible to easily filch a caravan when the wheels won’t roll. Even the most organised thief would find it difficult to remember to bring along a spare set of wheels to the scene of the crime. You get that sort of security for under $100. 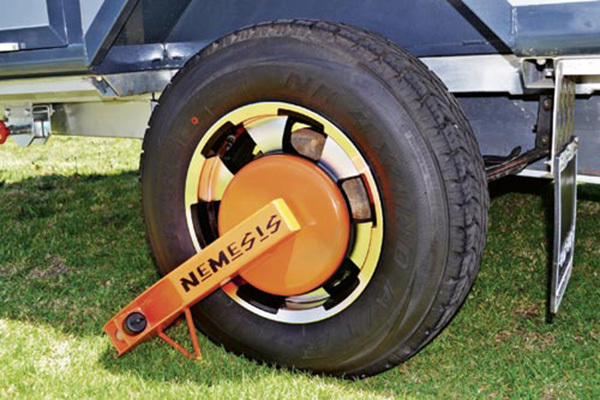 The Purple Line Nemesis wheel clamp is among the most popular products. It’s very visible and resistant to cutting, drilling and freezing. Although MicroDOTS sound like something James Bond might take on a mission, they’re actually something that’ll help keep your caravan safe or at least make identifying your caravan and perhaps some of your belongings identifiable. MicroDOTs, like AL-KO ATS, are tiny metallic flecks. You can’t see them with the naked eye but they contain a unique code laser etched into them multiple times. You can brush or spray thousands on to your caravan and consequently tag your rig so that you can prove ownership to the police in the event of theft. You can register this code with police to make the process of identification a little easier. 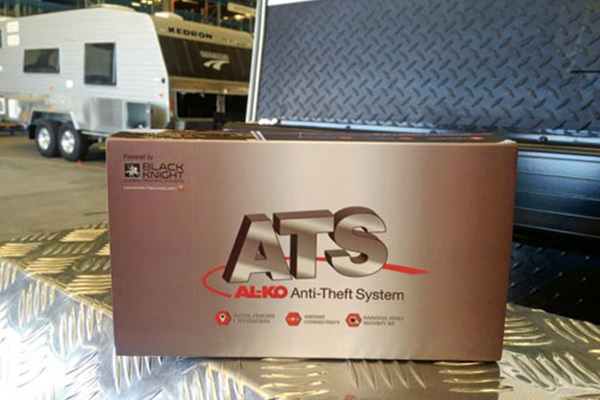 The AL-KO product can be used with a dedicated app and AL-KO’s Black Knight GPS tracker. GPS tracking once belonged solely to secret security organisations and NASA. These days, GPS technology is everywhere from your car to your smartphone. 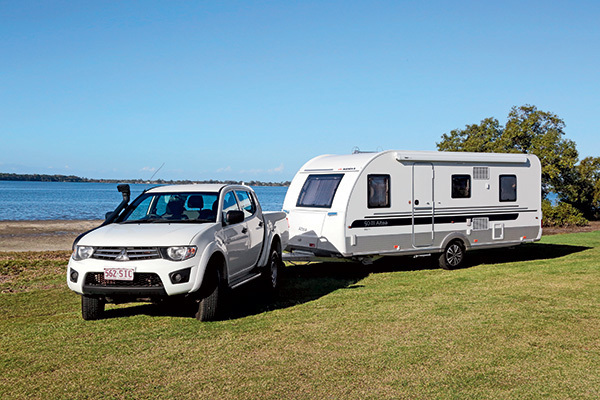 Now, for less than $200, GPS tracking technology can track your caravan. What’s more the devices are small; they’re likely to go unnoticed. The unit will turn on whenever the caravan moves. Then it’s just a matter of using a smartphone app or website and you can track the caravan in real time. Making your van less attractive doesn’t mean throwing mud over it or kicking dents into the sides. It means keeping valuables locked away and out of sight. Also, always keep your van locked preferably with quality locks and security doors. This means not being complacent. That time you nick out for ‘just a minute’, and don’t lock your van, is the only minute a thief needs to knock off the microwave or your favourite camping heirloom. As most caravans that are stolen are never recovered, making them more secure is the best bet. So when you’re camped out somewhere and you leave the van to take in the sweeping panorama, there’s a better chance the van will still be there when you get back if you use a range of devices and a style of security that best suits your needs and your budget. Remember, choosing to secure your caravan is about being realistic rather than paranoid. You own a caravan worth many thousands of dollars, so it seems reasonable to protect it, especially as that protection is worth just a few hundred dollars.